Longitude (Meridians) and Latitude (Parallels). The Equator, as well as the Tropic of Cancer and the Arctic Circle in the northern hemisphere, are precise points in degrees of latitude determined by the sun's apparent travel over the earth's surface. 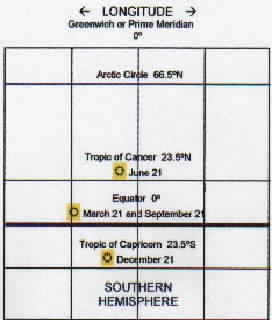 The sun is over the Equator [0� latitude] on about March 21 and September 21 and on these dates days and nights are of equal length (the Vernal Equinox and Autumnal Equinox). The sun is over the Tropic of Cancer [23.5�N latitude] on about June 21, the longest day of the year. (The sun is over the Tropic of Capricorn [23.5�S latitude] in the southern hemisphere on about December 21, the shortest day of the year in the northern hemisphere; in the southern hemisphere the seasons are reversed). Because of the earth's curvature, the Arctic Circle is the point at and above which there is at least one day a year of total light. The further north one travels the longer the periods of total light. During this time the sun never sets but appears to circle the horizon in a more or less elliptical shape, higher in the south and lower in the north. At the north pole, there are six months of "day" followed by six months of "night." During the periods of total light, the sun appears to circle equidistant from the horizon. (See "The Sun in High Latitudes"). Parallels or degrees of latitude are equidistant throughout the globe. Degrees of latitude are 60 nautical miles [69 statute miles] apart. Meridians or degrees of longitude are not equidistant because of the curvature of the earth. They are furthest apart at the equator and converge at the north and south poles. O� longitude, the Prime or Greenwich meridian, passes through Greenwich, England; the 180� meridian, or the International Date Line is at the opposite side of the earth in the Pacific Ocean. Time "begins" at the 0� or Prime Meridian. Universal (UTC) or Greenwich Mean Time (GMT). The sun's apparent travel over the earth's surface is at the rate of 15� per hour. Time zones are established roughly every 15� of longitude so that local times correspond to hours of day and night. Greenwich Mean Time, or the newer term Universal time--made necessary by space travel--, is a single coordinated time standard throughout the globe. For example, in the Eastern Time Zone, add 5 hours to Eastern Standard time for Universal Time, and 4 hours to Eastern Daylight time. Zulu time. The standard symbol for GMT and UTC is the letter "Z." In the phonetic alphabet the letter "Z" is spoken as "Zulu."